Our 2013 Premier Princess, Joni Brummel, has consistently exhibited the Spirit of Premier by serving others and honoring God through her Premier Business. She and her husband, Mel, are Silver Executive Directors from Michigan and have been Jewelers for 18 years, building their business and leading others with integrity, kindness and an eagerness to help others excel. Have you ever wondered how one decision could change a life in such a dramatic way? In 1985, God called Andy and Joan Horner to start Premier Designs, Inc. based on the Philosophy and Purpose to honor God and serve people. Little did they know that their one decision would be used by God to change not only theirs, but countless lives … just like ours! Becoming a Premier Jeweler was that one decision for me – it impacted my life in dramatic ways. Mel and I joined Premier in April of 1996 to earn additional income to help our daughters attend college. I was a nurse and we were managing a local campground here in Michigan. I did not wear jewelry; I was the furthest thing from a “sales person.” God has used this business opportunity and the people of Premier to teach me about finances, leadership, relationships, and faith. Finances: Working our business has provided for our family financially. Becca and Melissa, and a beautiful wedding for Melissa and Dave. God has provided financially through our hard work and Premier’s generous compensation plan more than we could have ever imagined. It’s our joy that both of our daughters are also Premier Jewelers and working their businesses to support themselves and their families. Leadership: It’s a blessing to serve our Downline and grow our business. I have also been given the privilege to help many other women start their own Premier businesses. I have been greatly touched through the lives of these women, including my daughters. These ladies have become not only my friends, but they have become amazing leaders who serve to enrich the lives of the people God brings into their life. Relationships: The Premier Family is amazing! We have really enjoyed the friendships Premier has given us with fellow Jewelers, but one of the unique blessings for me over the past 18 years is that over 1,000 women have invited me into their homes. As I share the hope of Premier with my Hostesses in their own home, I have been encouraged generously by them. God has used Premier’s Hostess Plan to bless countless Hostesses with free jewelry and a night of fun and fellowship with their friends. 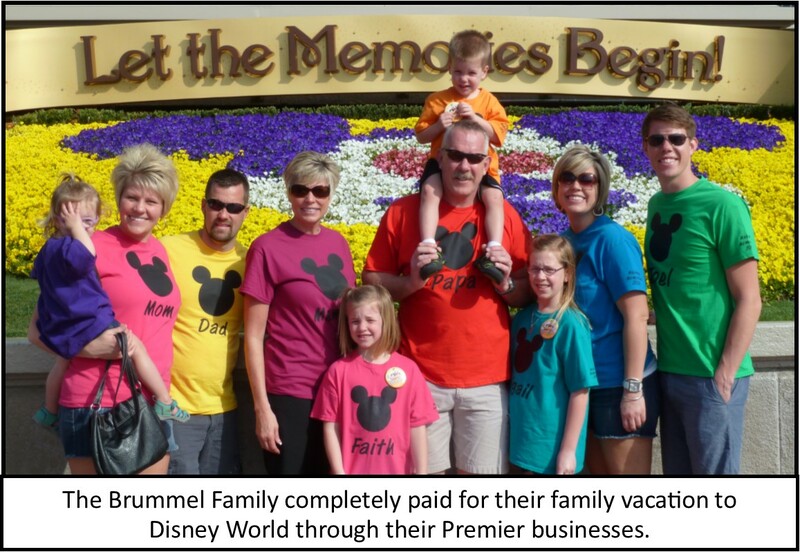 Not only have we been impacted by our extended Premier Family, but the Brummel Family values the many memories we have been able to make together on leadership trips, at Rallies, and various Premier events. We work alongside of one another, and we do life together as a family in Premier! We “Count It All Joy” to be in this together and see the blessings of Premier as it reaches out to others. Faith: Premier has deepened my relationship with God. This is the greatest impact Premier has brought to my life. His patience, love and faithfulness to me are truly life-changing. Through Premier, God has given me countless opportunities to share His amazing love and grace with thousands of women. When they believe Premier is just about jewelry and earning money and they find the love and hope of Jesus in this business, my heart overflows with joy! Saying “YES” to Premier’s opportunity to enrich lives and serve others was that one decision I made that has truly changed my life forever. Love learning about Family, Finances, Leadership, Relationships, and Faith from this amazing example of God’s love! Thanks Joni for your faithfulness through the years! I had the opportunity to meet and talk with this amazing couple at my first Rally in 2005. When I see them at Rally, they might not know my name at first, but they always ask how I am, how’s my business….they are sincere with that and not just saying it. A Royal Couple for sure! Mr. Premier and Princess!